With this inline-air-flow probe you have a device that performs accurate measurements of volume air-flow in compressed air and gasses. The inline air-flow sensor is used in areas of industry, wherever air or gas is transported through pipes, consumed or emitted. The inline air-flow sensor is especially recommendable wherever clean and drop-free pressured air, azote or other gasses are transported through pipes. By means of its two keys the inline air-flow sensor is multiplicative configurable so the sensor is easily to control. The integrated measuring distance of the inline air-flow sensor is very well applicable for a simple montage. 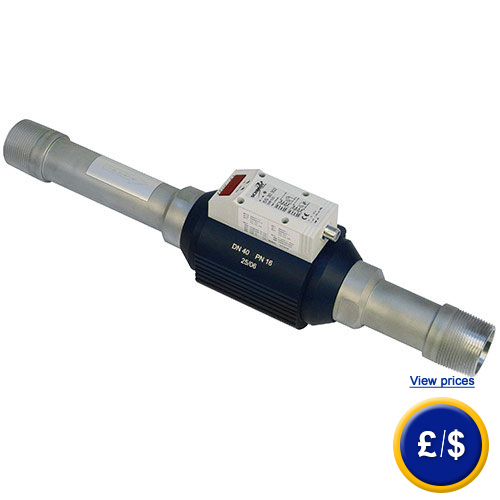 This measuring distance allows a direct measuring with a very low pressure loss. The inline air-flow sensor series proves to be manifold due to being able, depending on the device, to measure the flow rate, the total quantity or the temperature of the medium. Those determined values will then be shown eligibly on the display, which also shows the settings of the units and the measuring value damping on the inline air-flow sensor. The inline air-flow sensor has a measuring range for standard volume air-flow up to 712 m³/h and at a temperature level of 60° C. Those measurements can even easily be determined at a pressure of 16 bar. For further information about the inline air-flow sensor SS 30.30x, please read the following technical data or call our Hotline: +44 (0)2380 987030. Our engineers and technicians will gladly advise you with the inline air-flow sensor SS 30.30x or all other products in the terms of regulation and control, scales and balances of PCE Instruments.